Okay, so I was a little ambitious yesterday. We only made it through the girls' room in our spring cleaning adventure and then we got kicked off the field by soccer practices when we were trying to fly our kites, but the weather was a perfect upper 70's and we still had fun. 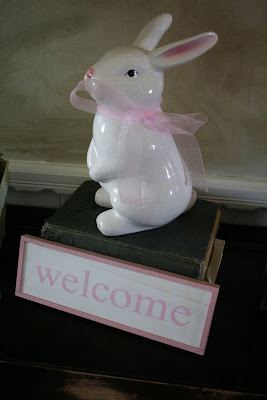 and the welcome part next to my bunny in my entryway. Nope, this one isn't spray painted. She's got a lovely crackly finish, pink ears and pink nose, and has lots of sentimental value~I didn't touch her. I'll have a little more spring fluffiness next week, but for now, have a wonderful Wednesday! I love being the first to comment on your posts can you tell?!? It's that being the first to open the new jar of peanut butter kind of feeling! :) I have to say I am so relieved you didn't touch our Big Lots bunny!! I have mine on my shelf and have been worried I should be painting him over, but couldn't bring myself to doing it! I love that we have that decoration in common even to this day! Love your fluff! Love all your beautiful springiness! And I totally have quail sneaking in my house at all hours laying eggs in my topiaries. Doesn't everyone have that problem? So Sweet and welcoming... I loved your bunny!!! So charming, looks pretty "springy" to me! Your decorations are very cute! Very cute decorations! That laying down bunny is very sweet! All the decorations are simply cute Melissa! Everything looks fabulous! Just like spring! All the decorations are soo cute. Very fun! Thanks for sharing all your spring-y lovelies! Hi, Melissa, thanks for joining the party! I love all your springy things, esp. those bunnies. And the quail eggs and topiary are really fun too. I love that you cut up the Target find! So totally something that I would do too! The quail eggs are awesome! Spring has definitely sprung at your house. I cracked up at your quail laying eggs on the topiary comment. I could so picture that. Great post. Oh, I love the idea of cutting up the egg thing! I can't tell you how many different hanging things of come acrossed that I thought were cute, BUT I didn't have anywhere to hang them! GREAT idea! 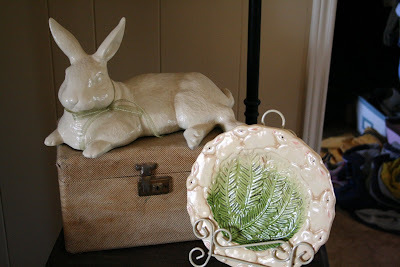 The bunny plate is so cute and bunny next to it too! 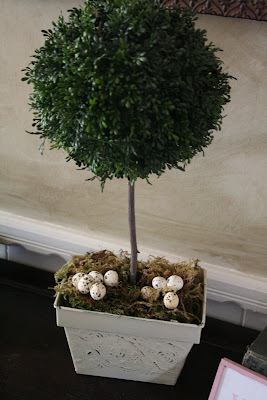 The quail eggs in the topiary is a cute idea! So cute!! 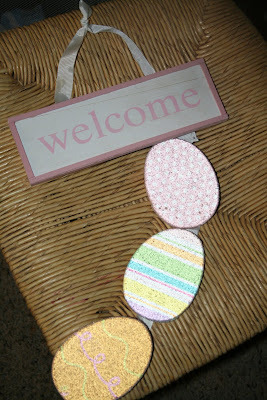 I love the egg wreath, I am going to keep my eye out for after Easter sales and I try to get me enough to make a wreath. Love the bunny plate. Easter is, indeed, right around the corner!! be found on our main page? blessed and be a blessing! 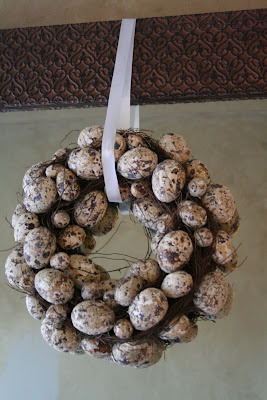 Very cool egg wreath. I want one so bad. I like the bunny that's laying down too. Everything looks great! Beautiful spring decor! Love the quail eggs. I love your spring decorations, that little bunny is adorable. 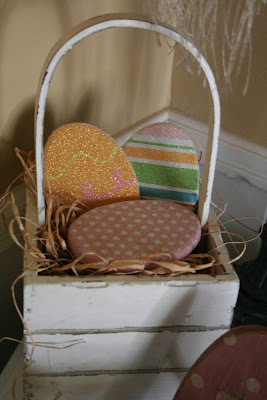 I think the little eggs look cuter in the basket then hanging in a line, you always do such cute things! Hey, I'm having a giveaway, come and visit! Very cute! I love Target! Cute spring fluffiness. The quail eggs under the topiary are sweet. I'm really wishing it were spring in AK. I've got all my spring decor out, but it's still 10 degrees and snowy. Won't mother nature take a hint?? Love that fat little bunny and that wreath is to die for. Great Spring decor!!! I'm in love with your great big bunny! !